After superb weather on the previous weekend very wet conditions were faced by the competitors on the Sunday of the second week of the Skoda IW tennis Championships at the Ryde Lawn Tennis and Croquet Club. In the most hotly contested event of the first weekend Martyn Bailey (West Bay) took the mens singles title in his first time of entering overcoming a previous champion, Peter Reynolds (Ryde Lawn) 7-6, 6-3. 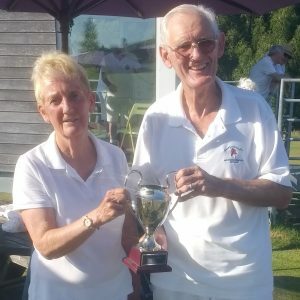 He then proceeded to win the mixed doubles event partnering Ella Parsons (West Bay) overcoming the more seasoned pairing of Richard Hutchins and Christine Harrison in a closely fought final. The ladies singles title was won by Maddy Clewett (Ventnor) who completed the round robin event without dropping a set. The ladies doubles final was a one sided affair, Kahren Barter and Suree Russell (Ryde Lawn) dropping only one game in securing the title. Their opponents Sarah Moore and J – Lo Moore (Ryde Lawn) were pushed hard in both their preliminary rounds and deserved their place in the final. On the very wet Sunday spectators were treated to fine mens doubles play. Ben Brading and Mikey Foulkes (Ryde Mead) easing out Simon Jenkin (Ventnor and Ryde) and Jack Stapeley (Ventnor) in a very tense affair 6-4, 7-6 to take the trophy. In the 60 + events Ann Tapley and Tom Carter (Ryde Lawn) took the mixed doubles trophy. Robert Stead and Mike Munns (Ryde Lawn) winning the mens doubles event for the first time. The presentations were made by sponsor Mark Winkles of Skoda Westridge Garage. Next years event has been provisionally scheduled for 17/18/19 and 25/26 August 2018. 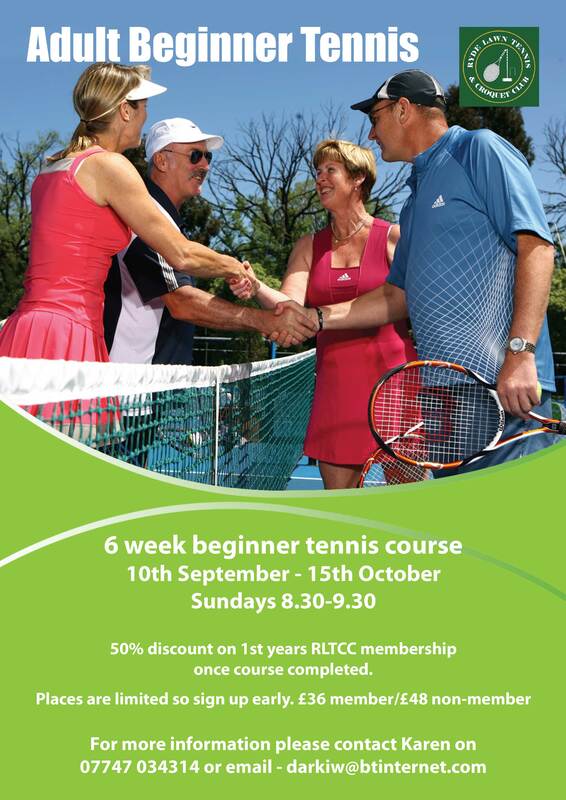 We will be running a six-week beginners’ tennis course on Sunday mornings 8:30 – 9:30 starting on 10th September. Cost is £36 for members or £48 for non-members (who will receive a 50% discount on their first year’s membership after completion of the course). For more information or to book a place please contact Karen at the number or address on the poster. 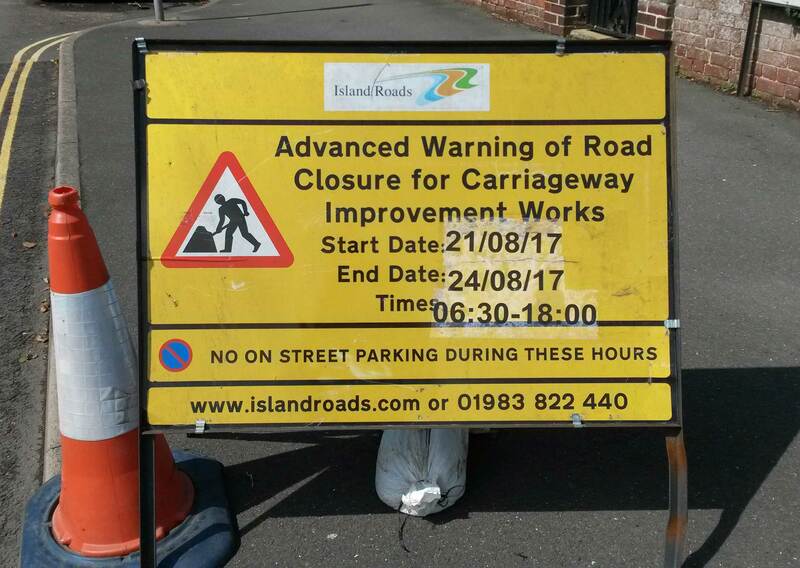 Playstreet Lane will be closed for resurfacing between 21/08 and 24/08 – dates have reverted back to those originally advised by Island Roads! There will be no on-street parking allowed and no vehicular access between 06:30 and 18:00. Pedestrian access will remain open. Please use alternative parking on Partlands Avenue, Ratcliffe Avenue or Pound Mead. 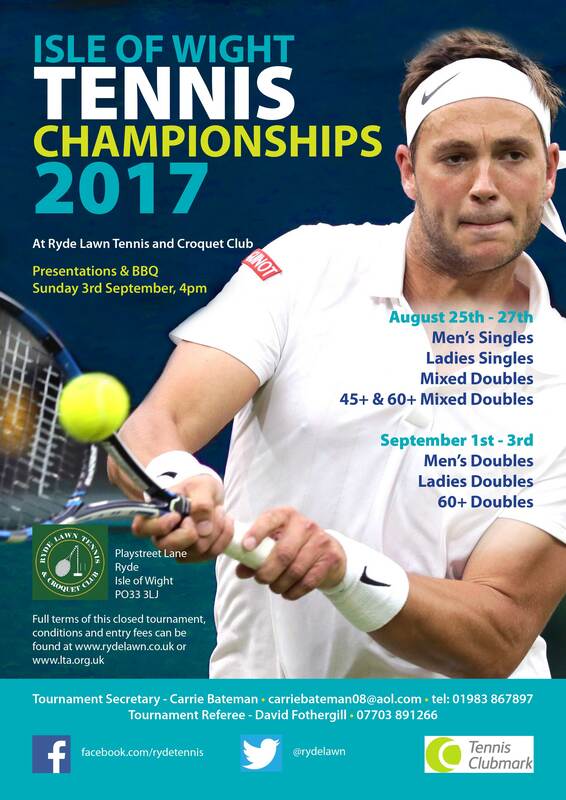 The 2017 Westridge IOW Senior Tournament will be held at Ryde Lawn Tennis & Croquet Club on the weekends of August 25th-27th and September 1st-3rd. Further details here. 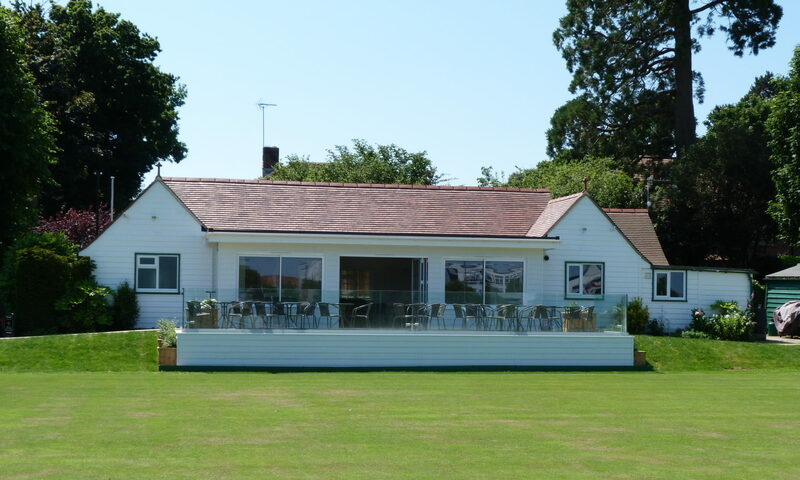 A short ceremony to mark the official opening of our refurbished Clubhouse will be held on Saturday 15th July starting at 1.15pm with the ribbon being cut by 1.30pm. Parking space will be at a premium as we will be reserving several of our car parking spaces for our official guests including our MP, the Deputy Mayor, President of the Croquet Association and Chairman of Tennis Development Committee. Additional parking spaces are available in Partlands Avenue, Ratcliffe Avenue and Pound Mead. Please arrive by 1.00pm when we will be offering a complimentary glass of Pimms or Fruit Punch along with sandwiches. Two, short, “speeches” will be given at 1.15 by Richard Hutchins, Chair of Project Committee and Hilary Spurgeon, longest serving club member, followed by the cutting of the ribbon by Hilary and one of our youngest junior members, Ashiana Turney. After the ceremony please take the opportunity to try your hand at croquet, test your service speed, pit your ability against the ball machine or just use the croquet and tennis courts. 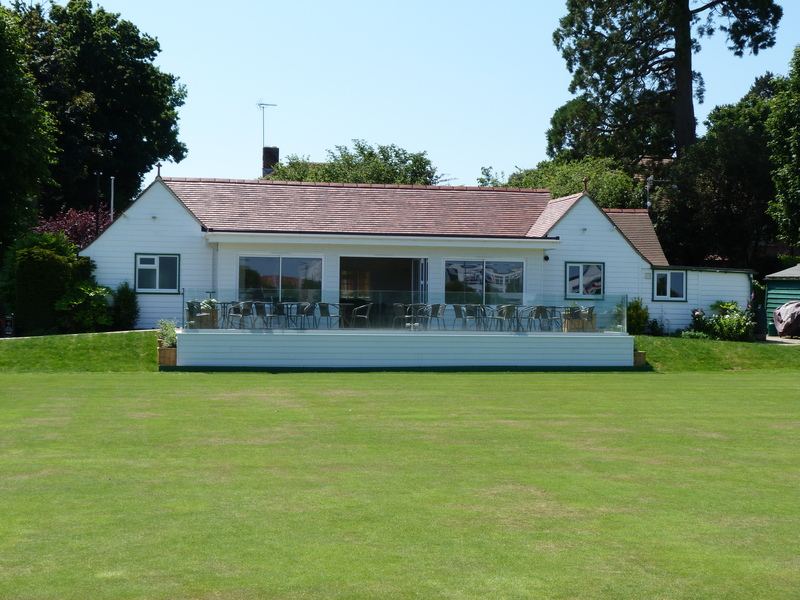 A BBQ will be available between 2.00pm and 4.00pm along with cream teas which could be enjoyed in the clubhouse whilst watching the Wimbledon ladies’ final and, of course, the bar will be open!!! Please come and support the opening and be part of an official photograph that will replicate the original opening 110 years ago! We will look forward to seeing as many members as possible at this exciting occasion in the club’s history. 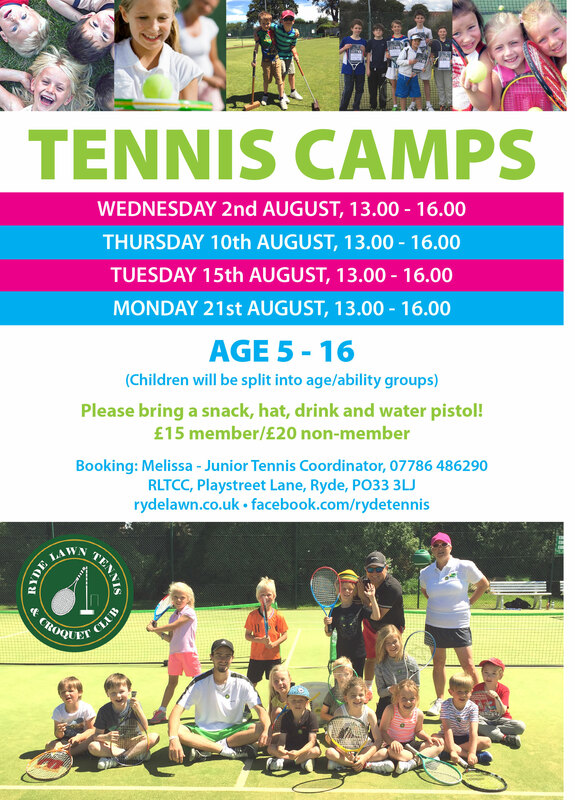 RLTCC will be running the ever popular Junior Tennis Camps again over the summer holidays. 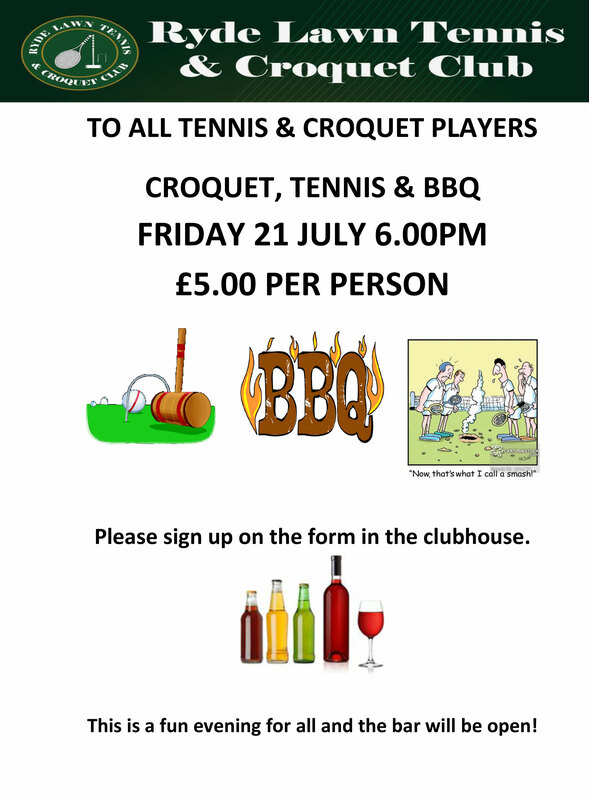 All tennis and croquet players are welcome to join in a fun, social evening of tennis, croquet and petanque with a BBQ running and the bar open. 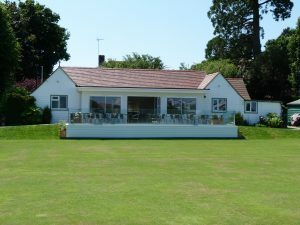 Friday 21 July from 6pm – £5 per person – please sign up in the clubhouse. Congratulations to Pam Sim and Nick Westmore on winning the 2017 Solstice Cup. The Southern Croquet level play doubles GC tournament was held last week at Hamptworth. Both teams from RLTCC reached the final so a win for Ryde was guaranteed! 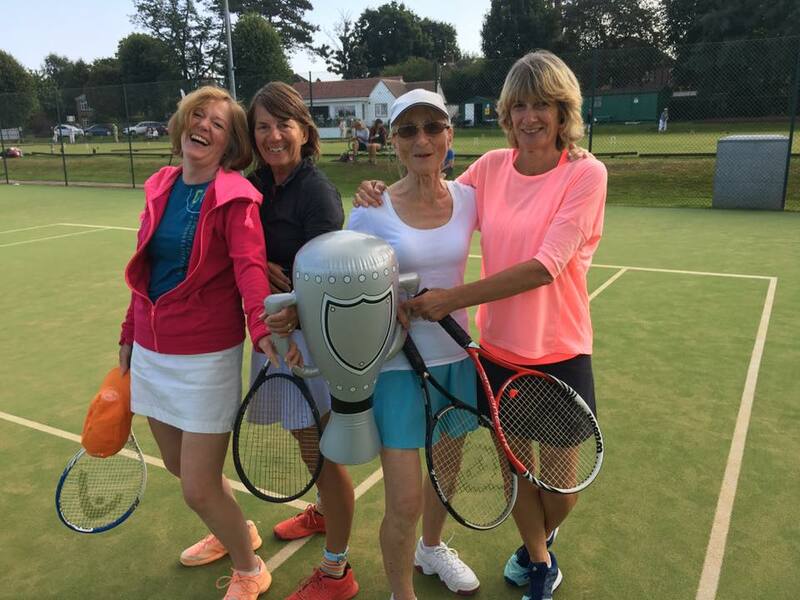 Pam and Nick came through victorious in the final to regain the trophy which Jim and Richard had won in 2015. 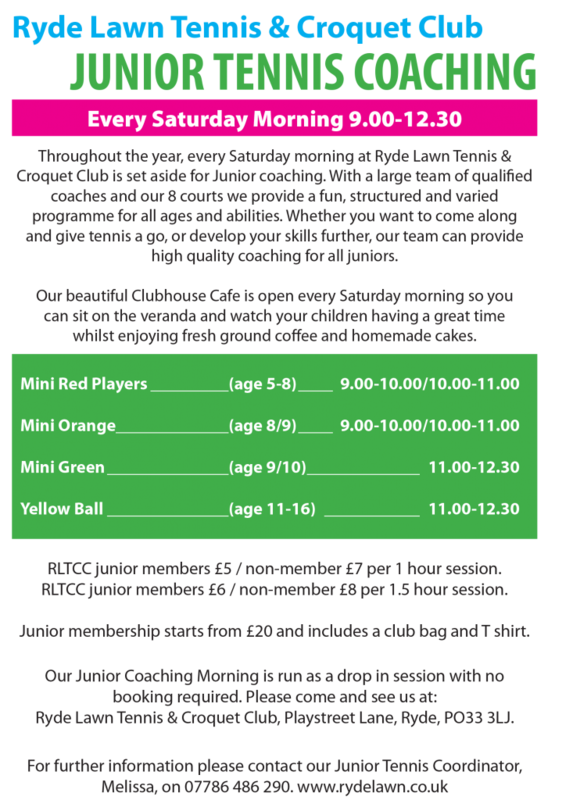 Summer is on its way and so are our very popular Thursday evening Family Club Nights. 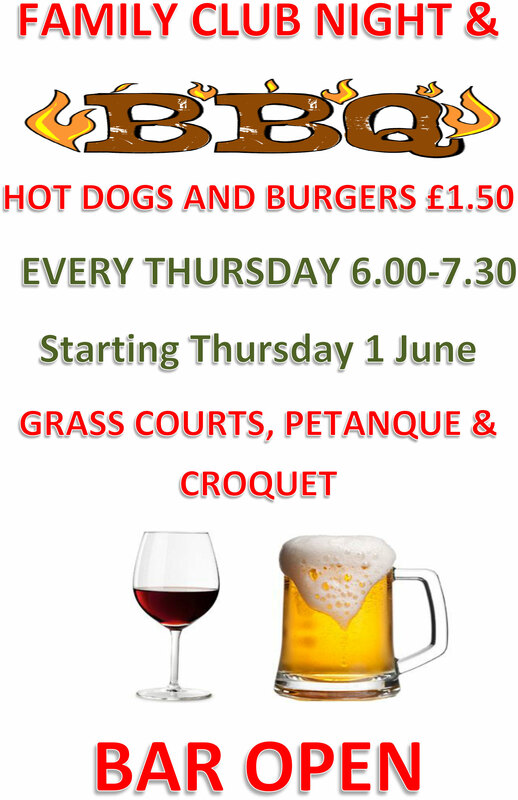 They will re-commence on Thursday 1st June – running between 6.00 pm and 7.30 pm. 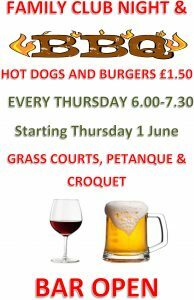 Join us for a barbeque (hot dogs/burgers) and try your hand at Petanque, Croquet and Tennis (grass courts only available). Our newly renovated bar and patio will also be open if you just prefer to relax!